The office building outside my window says that it is 4° in Toronto- a bright, glorious heatwave compared to what it's been like these past months, and the first time I've been able to wear open toed shoes without knit stockings. Next week I'll be in NY where it is three times as warm. Time to break out the sundresses. Hurrah for spring! A little risky in the death department (particularly if you have a ceiling fan, though I acquire more injuries from head-butting doorframes and falling down stairs), but very pretty. P.S. They look similar to this Gucci design from 2006, don't they? Posted by la femme at 10:32 a.m.
Those are gorgeous! I have some shoes that are similar in shape to the last pair (not design, sadly, although they are suede). Although they make me about 6'2" (1.8m), the hardest part about walking is the problem I have with all platforms. I forget that the bottom of my foot isn't against the ground, so I have to be careful to lift my feet more when I walk. Especially when walking up stairs. i don't know i guess just the platforms, the shape of the toe, the heel, and the top of the toe.. okay yeah they do. Hot shoes, I want those black ones! these yellow shoes are beautiful with grey pants ! 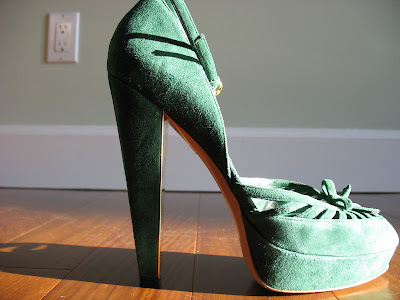 Gorgeous shoes but they look like they're designed to cause accidents. 4 degrees?? you are brave to be wearing open toed shoes. if i've calculated correctly that's only about 40 degrees fahrenheit haha. anyways, good for you and i hope your toes don't freeze! ah! these shoes make me want to run out and buy some more heels! I have only been investing in flats now-a-days thanks to all the running around on treacherous ground i have to do on campus. i miss the fun of heels, but i don't miss the falls and aching feet at the end of the day. Love them all! The yellow are my favorites. you are brave but how can you keep those sunshine yellow beauties in hiding. i'd risk it too. Oh, what a beautiful shoes ! The yellow really fits well with the pants, suprising. I enjoy reading your blogs!! i love it! Oh I know those yello YSL's are everywhere but I love them! I already know exactly how I would wear them...too bad I'm a poor and lowly student!! Love the blog!